300+ unique, royalty-free MIDI loops! Modular synth loops and FX in a MIDI setting: an essential collection for any dance or ambient music producer. In the 1970s and 80s music produced by instruments like the EMS Synthi 100 or the ARP 2600 was defined by the instruments' limitations - lack of polyphony, or the lack of it, random pitches, mechanical rhythms. While an ARP or an EMS sample is fun to have in your library, it's not easy to produce ARP or EMS music unless you re-create the sort of technological environment in which these pioneering synthesizers existed. 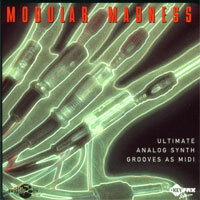 Modular Madness is a collection of parts such as modular synthesizers used to produce. Here you will find all manner of arpeggios, runs, effects, slides, squeaks, even MIDI TB303 lines that, put bluntly, you would never find yourself playing on a modern MIDI keyboard in a million years. Use this collection as a starting-off point for a more customized composition, or build an entire track around a single pattern using the power of remix.